At the center of our galaxy lurks a supermassive black hole. It turns out that this monster isn't alone. 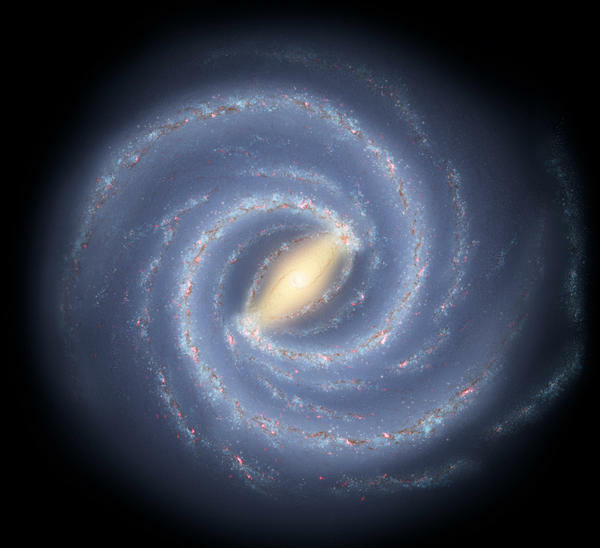 NPR's Nell Greenfieldboyce reports that scientists recently went hunting for more black holes at the center of the Milky Way, and they found a lot. NELL GREENFIELDBOYCE, BYLINE: When massive stars die, they sometimes collapse down into a black hole, a truly weird part of space where the gravity is so strong, not even light can escape. Astrophysicist Chuck Hailey at Columbia University says black holes are just bizarre. CHUCK HAILEY: It's truly the case that they're kind of tears in the fabric of space-time, right? You go through one, and once you're through it, you can't communicate with the rest of the universe. GREENFIELDBOYCE: Scientists have known for a long time that a giant black hole with 4 million times the mass of our sun appears to lie at the center of our galaxy, and the thinking has been that it should be surrounded by many, many other black holes that originally formed farther away. HAILEY: Because they're so heavy, they naturally sink or gravitate towards the supermassive black hole in the center. GREENFIELDBOYCE: But Hailey says no one had actually seen any sign of this. HAILEY: This is just kind of astonishing that you could have a prediction for such a large number of objects and not find any evidence for them. GREENFIELDBOYCE: Now, black holes aren't the only things at the center of the galaxy. It's a busy place. HAILEY: It's a place that's filled with a huge amount of gas and dust, and it's jammed with a huge number of stars. GREENFIELDBOYCE: And it's been studied by NASA's premier X-ray telescope. Hailey and his colleagues went back through archived observations made by this telescope to look for evidence of black holes. They knew that isolated black holes are almost impossible to detect because they're black. But when black holes pair up with companion stars and interact with them, this produces telltale X-ray signals. In the journal Nature, the team now says they spotted a dozen black holes paired with stars all within just a few light-years of the central supermassive one. HAILEY: We believe that these 12 objects are the tip of an iceberg. GREENFIELDBOYCE: He says calculations based on their new data show that our galaxy's center must be home to around 10,000 black holes. FIONA HARRISON: You know, I think this is a really intriguing result. GREENFIELDBOYCE: Fiona Harrison is an astrophysicist at Caltech. I asked her how many black holes you'd expect to see in a random, similarly sized patch of space someplace farther out. HARRISON: If you took sort of the outskirts of our galaxy not in a dense star-forming region, the answer would be zero (laughter). So this is a real high concentration. GREENFIELDBOYCE: She says if this new study is correct, the centers of galaxies could be chock-full of black holes having weird interactions with each other and with the supermassive black holes that they swarm around. Nell Greenfieldboyce, NPR News. (SOUNDBITE OF RAMIN DJAWADI'S "BLACK HOLE SUN") Transcript provided by NPR, Copyright NPR.